The Islamic Society of North America (ISNA) is coming to Columbus for its annual convention at the end of August (46 days and counting! 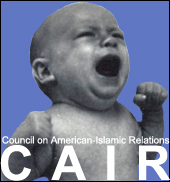 ), and I thought it appropriate to remind our readers exactly who and what ISNA really is. 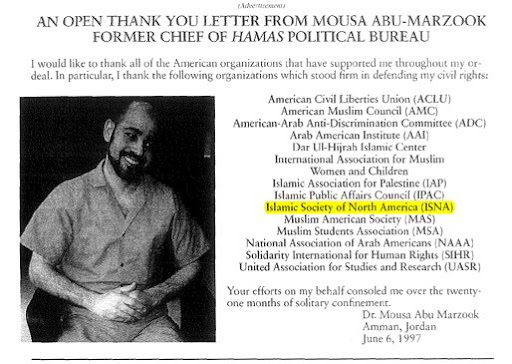 For instance, in 1997 after he was deported to Jordan (two years after he was designated a terrorist by the US government) HAMAS terrorist leader Mousa Abu Marzook published an open letter in the Washington Report of Middle East Affairs in thanks of the support by American Islamic organizations that had aided him and contributed money to his defense fund in the two years he was incarcerated while the US government was trying to deport him (Jordan would also deport Marzook and the rest of the HAMAS leadership). For more detail on ISNA’s legacy of terror and extremism, see the extensive report prepared by the International Assessment and Strategy Center, “Extremism and ISNA”.